But when children understand what to expect and what is expected of them, they are always much better behaved. If parents are prepared and prepare their children as well, travel with little ones can be an absolute joy! Links to recommended articles - each emphasizing the need to involve children in preparation for the trip! Tools (DVDs & Books) to Prepare Toddlers for Travel. A personal entry in honor of a very special young traveler, whose family I am honored to support. Maddie James is 5 and 3/4 years old. With family all over the world, and parents who love to travel, in her young life she's made her way across the United States and a couple of oceans. But Maddie James can't travel anymore. A month ago, Maddie was diagnosed with a terminal, aggressive brain cancer that will kill her before her 6th birthday. (2) to memorialize their daughter "in a way that is worthy of their very special little girl. A place where they, and everyone who loves her, can go and remember her. 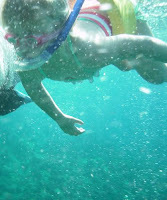 A place where other children and their families can visit and make memories and learn about the ocean and its preservation." Please, if you can, support this family and their sweet Madeleine Reese in support of their Foundation to raise funds for the Ocean Institute's Seaside Learning Center - which when completed will ideally be in the name of Maddie James. Photos posted with permission for this blog entry. (c) Kajsa and Collie James. Sidenote: Apologies if you've received notice of this post more than once. There was a bit of a hitch with the Blogger interface. Thank you for subscribing. Becky Worley, ace correspondent and mother of twins, featured Shae by Air and other parent travel tools on Good Morning America this week. It's cold outside! Whether you and your little ones are en route to a warmer place or off to enjoy the snow, these tips will ensure that getting there is safe, fun and drama-free. Travel Expert Anya Clowers, RN, is a post-surgical specialist and thirty-year veteran of air travel. Her flight experience covers 34 years and over 400,000 miles. Anya flies monthly testing and reviewing products and services with her toddler son. She is the Creator and Author of Jet With Kids: the book, website, newsletter, and blog. Her expertise and passion are providing products and tips that provide comfort for practical issues travelers face. Anya teaches that self- sufficiency is required for successful travel in today’s world of aviation. When she is not at 37,000 feet or in an airport, she resides in Northern California with her husband and son. Prepare yourself and the kids ahead of time. "The key to happy kids are involved parents. Talk to your kids, read to them (even the safety card can be entertaining!) Talk about the plane, airport, runway, noises, seats, etc." A stroller/carrier is a MUST HAVE when traveling with kids. "Do not make the mistake of thinking a stroller or carrier is just one more (unnecessary) thing to take along! A lightweight stroller or carrier WILL save your trip, your sanity, and your back!" Do not rely on the airport, airline, hotel, train, bus, or anyone else to provide the basic needs of food and drink. "Hydration is ultra important for the entire family when traveling. Dehydration or low blood sugar can result in crabby, uncooperative, irritable travelers (of all ages!)." ... And most importantly: "My biggest tip is to be flexible. Whether it be a sick child, weather delays, traffic jams on the way to the airport or viewing the word CANCELED next to your flight number, holiday travel – actually any travel with kids, requires flexibility. "If you bring with you the right attitude and pack wisely – then delays, cancellations, overworked and rude ticket agents, tantrum-throwing passengers (not always children), extra time on the tarmac or an ill-timed-teething baby will not ruin your family trip, but instead just be small changes that you roll with." Travel deals abound in this economy. If your family is in a position to take to the skies, there's no better time to do it! But, you say, my children are so young! Yes, I nod with understanding. This is precisely why you should go. While we're adamant about preparing kiddos for what to expect before they get on the plane, we couldn't resist this gem a friend alerted us to (thanks, Andy!). * Not recommended for purchase, but absolutely recommended for reading! The Play Security Checkpoint is dubiously useful at best, but the buyer comments are priceless. Enjoy! When it comes to flying, cruising or roadtripping with children, no one knows better what a traveling family needs than a parent. As one myself, I have a passion for and a great interest in ideas executed by 'traveling parent-preneurs'. In the first of an ongoing series, today's feature introduces the families behind the YakPack and the BearHug. The best products are the ones created from a need, and rarely has there been a need so acute as that experienced by the Phillips family on a multi-state roadtrip that resulted in three children ill in the backseat. As Mrs. Phillips writes, "The worst part of the trip was in Kansas. We stopped at a rest area, stripped our three year old child in the bathroom and washed her in the sink. It was so horrible that I couldn't stop from gagging. That's when I realized in my rush to the bathroom, I had left her change of clothes in the car. I threw away what she was wearing and wrapped her in my coat. 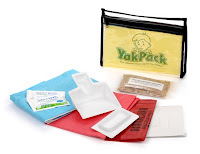 "Because of this and other horrible experiences, my husband and I created the YakPack - the Ultimate Clean-Up Kit for Sickies. Had we only a few YakPacks on board the mini-van vessel, we could have prevented the aftermath. Now, we never leave home without them." I gifted a YakPack to a family friend whose daughter gets car sick on any trip lasting longer than about an hour. They were leaving for a summer camping trip in the mountains, and I couldn't have offered a better road trip product for them. Highly recommended by both our families! 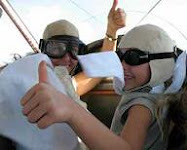 There is also a great post over at the JetWithKids.com Blog about how best to use it in flight. Also highly recommended: the Dioquino Family's BearHugs - the ultimate in multi-tasking travel comfort for children. Taking into consideration the needs of warmth, allergies, germ protection, comfort, practicality and even the cute factor, BearHugs are part blanket, part wrap, part lovey that can also be used as a backpack or a pillow. Perfect for travel by land or air ... and just as perfect for a sleepover as a movie night at home. Here's to clear skies and (smooth) open roads! If you too are a Traveling Parentpreneur and you'd like to submit a product for review, please email me at TravelingParentpreneur (at) goodlittletraveler.com. One parent friend of mine told me once that she and her husband weren't planning to take a family airplane trip until their then-2-year-old son was 6 - she was just too worried about what she imagined in her active son's potential bad behavior, packing and carrying all the necessary accoutrements that go with little ones, all the added details (and delays) that seem to go with traveling with toddlers. But after she had her second son and realized that if their family stuck to their no-planes-til-the-boys-are-6 plan, all told it would result in nearly a decade without a family trip! ... and she was ready to find some solutions to her dilemma. It has been argued that traveling with children under three is a waste of time. I've heard all the excuses: that biggest of which is that babies and toddlers are too young to remember what it is they are seeing and experiencing. My response to that is the same as any child development specialist's with regards to a child's exposure to being read to: exposure is a VERY good thing. My daughter doesn't remember asking me to read Big, Runaway Bunny or Where The Wild Things Are every night two and three times when she was two. But she still loves for me to read to her, and is now a great reader herself. I wanted my daughter Shae to want to travel. As she grows up, it is crucial that she understand that there are different ways of living, looking, building, believing, learning, contributing - and I want her to internalize this knowledge and act on it as a result of seeing it, not just reading about it. I am convinced that having a broader exposure to the world, domestically and internationally, results in better citizenship and commitment to one's community. What better way to appreciate what one has than by witnessing firsthand what others don't? What better way to understand that others do not think/problem solve/create in the same way as ourselves than by learning - even just a few words of - another language and realizing just in the sentence structure alone how differently the same idea can be expressed or considered? Having this belief in broad exposure as a benefit, coupled with my own selfish desire as a world traveller not to give up exploring just because I was now a mother, I set out in not-so-subtle and less obvious ways to raise her as a Good Little Traveler. From map sheets in the crib and a biplane rocking chair to a wall papered with old saved National Geographic maps and multiple bookshelves overflowing with stories about exploring, adventuring, discovering, journeying. I also took her on the road almost from the time she was born. But one needn't be as interested as I am in travelling as a rule, just open to the idea. I love this quote by Teresa Plowright at About.com, where she writes: "Travel is in many ways different from vacation: travel, for example, might be sightseeing in Paris, or exploring hill towns in Italy, or a road trip with plenty of stops and exploration along the way." 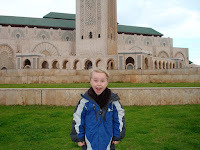 She goes on to write: "Travel with a baby or toddler entails logistics, no question. But gear is so great, these days ... And travel with a baby can be extremely rewarding, especially in countries where people tend to dote on babies." There are so, so many great reasons to take your infant / toddler / preschooler / kindergartner out into the world! Prepare now for a great flight! Our complete package has everything your family needs to make the journey as much fun as the destination, with items for both parents and children. Parents will learn what to avoid and what to prepare for with the expert guidebook Jet With Kids:Taking the Fear Out of Flying...WITH YOUR KIDS! Toddlers and child fliers will love the Shae By Air DVD Toolkit™, which demonstrates for kiddos what to expect and what is expected of them with a fun DVD movie about flying, plus a picture packing list and luggage tags. 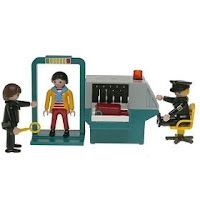 Available for purchase from our affiliate (and trusted favorite) site JetWithKids.com. LadyBug Mag for Children - Come Play! I'm a world traveler who didn't want to stop traveling just because I had a child. 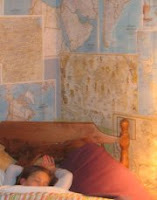 And I wanted my little girl to see our country and the world, straightaway without waiting until she was grown. Traveling with a baby proved to be something I could handle ... traveling with a toddler was a bit more daunting. Certain traveling should be fun at any age, I started Little Lima Bean Productions - a company committed to quality children's programming, with complementary tools and merchandise to enhance your child's travel experience. Shae by Air, the first in the I'm A Good Little Traveler! DVD Toolkit Series, is just the beginning. May the skies be clear, the lines be short and the plane be on time! !